Natural Health Practitioners have known for many years that leaky gut can contribute to a range of debilitating conditions. Consider leaky gut not as a disease but as a mechanism by which a number of different conditions can develop. A leaky gut is the pathway for how large nutrient particles, infections and toxins enter the body through the gastrointestinal tract and create all kinds of mayhem once they’re in, sort of like party crashers who slip through security and proceed to trash the house. It is useful to think of the lining of the digestive tract as a net with extremely small holes that only allow specific substances to pass through. The gut lining therefore works as a barrier by keeping out bigger particles that can damage the system and allows nutrients such as amino acids, sugars and fats to pass in to the blood stream. The gut is naturally permeable to these very small molecules so that these vital nutrients can be absorbed. Regulating intestinal permeability is one of the basic functions of the cells that line the intestinal wall. When someone has leaky gut (often referred to as increased intestinal permeability), the “net” in the digestive tract has become damaged, which causes even bigger holes to develop in the ‘net’, so substances that normally can’t pass through, are now able to. This increased intestinal permeability occurs in the small intestine. The large particles which include undigested food, bacterial toxins and microbes, now are able to pass through the lining of the small intestine which sets off a immune response. The immune system marks these large particles as pathogens and attacks them. The immune response to these invaders can appear in the form of any of the signs you have a leaky gut. These include food allergies, migraines and chronic fatigue. 4. Diagnosis of an autoimmune disease such as rheumatoid arthritis, Hashimoto’s thyroiditis, lupus, psoriasis, or coeliac disease. The main culprits are foods, infections, and toxins. Multiple food sensitivities are a hallmark of leaky gut, as partially digested particles of protein and fat may leak through the intestinal wall into the bloodstream causing an allergic response. Gluten is the number one cause of leaky gut. Other inflammatory foods like dairy or toxic foods, such sugar and excessive alcohol, are also implicated. The most common infectious causes are candida overgrowth, intestinal parasites, and small intestine bacterial overgrowth (SIBO). For example eating a diet high in refined sugar can lead to overgrowth of yeast species contributing to candida. Toxins come in the form of medications, like aspirin, non-steroidal anti inflammatories (NSAIDs), Advil, steroids, antibiotics, acid-reducing drugs, environmental toxins like mercury, pesticides and BPA from plastics. These substances can damage the lining of the gut. It is known that antibiotics kill off essential good bacteria which is associated with increased intestinal permeability. Chronic stress can lead to a weakened immune system, affecting the ability to fight off invading bacteria and viruses and worsening the symptoms of leaky gut. 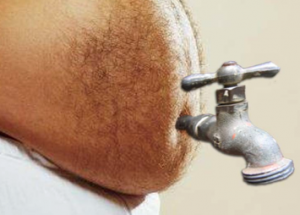 Excessive alcohol consumption, infection with parasites, age, radiation and chemotherapy can damage the lining of the intestine and are also risk factors also contribute to a leaky gut. 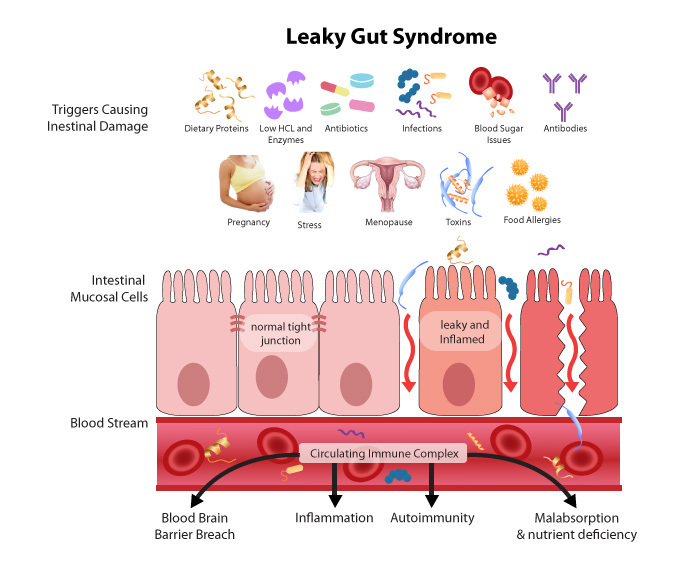 Emed has already explored leaky gut and useful nutrients to address leaky gut. Click here to revisit that article. What is an essential beginning however is an anti-inflammatory diet. This diet eliminates refined sugars, dairy, gluten, alcohol and artificial sweeteners which are some of the biggest offenders when it comes to inflammation. Consuming lots of anti-inflammatory essential fatty acids in fish and nuts, and eating green leafy vegetables, high-fibre and fermented foods that help to promote the growth of good bacteria is also worth considering. Taking a excellent quality probiotic can help heal a damaged intestinal lining by restoring balance in the gut flora. Glutamine is the principle fuel used by the rapidly dividing cells of the small and large intestine. With oral ingestion of glutamine, intestinal cells are able to increase in number to repair areas of hyper-permeability. If you suspect that you may have leaky gut, Emed is now offering an Intestinal Permeability Test. This test is a precise and non-invasive method for assessing gastrointestinal mucosal integrity. 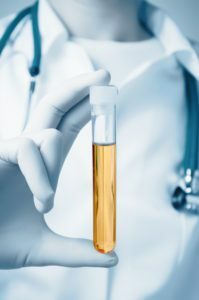 It is a urine test and is available for both adults and children (4-12 years of age). The Intestinal Permeability test measures the ability of two non-metabolised sugar molecules – mannitol and lactulose – to get through the gut lining. Mannitol is a small molecule that normally passes through the gut lining easily. It serves as a marker of how well nutrients are being absorbed. Lactulose is a larger molecule that doesn’t normally pass through very well through the gut lining and serves as a marker for whether there are large holes in the lining. To perform the test, the patient mixes pre-measured amounts of lactulose and mannitol and drinks it. The test measures the amount of lactulose and mannitol recovered in a 6-hour urine sample. Low levels of both mannitol and lactulose indicate malabsorption. Elevated levels of both lactulose and mannitol suggest general increased intestinal permeability, consistent with leaky gut. Permeability to lactulose may be increased, suggesting leaky gut, while permeability to mannitol may be decreased, suggesting malabsorption of small molecules. The lactulose/mannitol ratio is a useful value; an elevated ratio indicates that the effective pore size of the gut lining has increased, allowing larger, possibly harmful molecules to gain access to the body. If you would like to know more about Emed Intestinal Permeability (IP) Test please contact your Emed practitioner today.